Complementing the downstairs poolside Wahoo's River Bar and Grill, Flying Bridge is located on the Gordon River near the heart of historic downtown Naples. The kitchen serves a classic banquet menu of aged steak, fresh seafood and creative specialties. The wine list at Flying Bridge has received the 2012, 2013, 2014, 2015 and 2016 Award of Excellence by Wine Spectator magazine. Flying Bridge is now taking reservations throughout the week for dinner parties or private functions of 10 or more. While it's setting is ideal for any theme, Flying Bridge is the perfect venue for showers, wedding rehearsals, charity events, corporate parties and more. 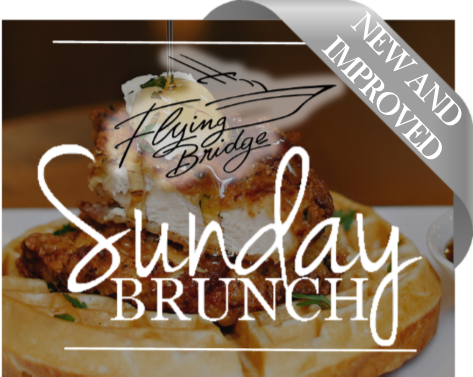 No party minimum is required for the award-winning Sunday Brunch which is 10am-2pm, but reservations are strongly recommended. Please call (239) 213-1441 for more information or to make a reservation. Also, please note that a complimentary, one day social membership pass at Walker's Hideaway Marina of Naples social membership is offered to all non-member diners.